Oops I posted my last post to the server edition.. I was wondering if you were going to update this to be used for 3.4. I cannot seem to get it to work on the new artifacts on the main toon, or when searching on a different shard on a different toon for that main toon. Best addon ever. I hope we can get it fixed unless I am missing something. Many thanks ! We have something that processes the artifiacts file in the Rift Discovery zip and converts the data into the lua required by our tables. So if you're doing it just for this addon, thank you -- but you can stop now. OMG, thank you! We could not find any mention of where they had moved it to! 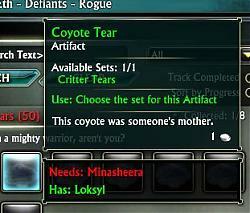 i'm in the process of extracting the new artifact sets. Any chance you'll implement them, too? I'll send then as soon as i'm finished (-ish)! 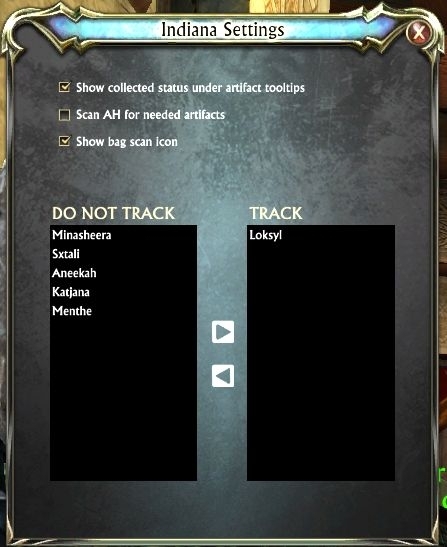 Are you extracting information about artifacts from the game files? It seems our original source of information, Trion's published Discovery.log file, is no longer available. Hi after the change the ScanAH does not work.. If you are on a character and you scan the AH it NO LONGER returns any info on the artifacts you are missing like it use to. Great addon, would love this part fixed ! Dammit, Trion! Breaking changes should be on a major release! And announced! Last edited by lokyst : 03-10-14 at 11:02 AM. Hi, after your fix the tooltips works again, but now the addon throws error reports on gathering nodes you hover your cursor over in the world, and also right now the Might Cores from the rift event. 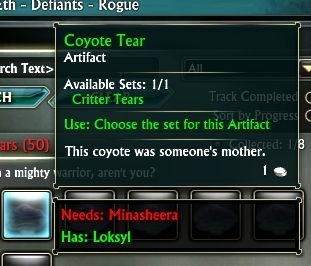 After yesterdays patch in Rift, the tooltips stopped working on artifacts you have in the bags; they work on artifacts in the guildbank or bank though. Last edited by Shocker74 : 03-07-14 at 01:28 PM. Since I needed it, I went ahead and created a data set for the unstable artifacts. Thanks. How did you get hold of these? I normally grab new artefacts with a script I use to scrape the discovery.xml files, but these items are not in there. Is there a better source for me to use these days? You can search for Unstable in the artifacts window on the character page, then mouseover and Inspect.Tooltip() to get the item type. So, I started at the top and worked my way down! That isnt a mistake, thats how it is! It looks like one has a trailing space to differentiate them, so that is what I copied. Last edited by adelea : 02-17-14 at 03:55 PM.